Soul Food for Young Adult Communities: 4th Sunday of Easter, April 21, 2013. SOUL FOOD FOR YOUNG ADULT COMMUNITIES, April 21, 2013: Fourth Sunday of Easter. LETTER TO SINEAD, MARK AND FRIENDS,- young adults together. ‘The Lamb will be their shepherd’. 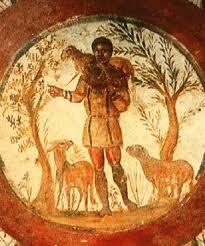 A very early painting of Jesus, the Good Shepherd,- in the catacombs in Rome. See how young Jesus is! Jesus, the Good Shepherd. And we’re not sheep, either, – we are people, intelligent, questioning, searching, creative, and sometimes lost. A good ‘shepherd’ of people listens to them, knows them by name, knows their needs and questions and doubts and struggles,- and the shepherd never leaves them, but rather would give his very life for them, if needed. And the Latin word for ‘shepherd’ is Pastor! And that’s what any priest is about,- with his people in God’s name, among them, knowing them, having a care for them at all times, and praying for them and carrying them, even as they pray for him and carry him. And then Jesus adds: ‘The Father and I are one’. Simple as that! It’s a Wow statement for us,- Jesus and the Father are one! Later, in John’s Gospel, at the Last Supper, Philip says to Jesus, in exasperation almost: ‘Jesus, show us the Father and we will be satisfied!’ And Jesus responds: ‘Philip, have I been with you all this time, and you still do not know me? Anyone who has seen me has seen the Father, so how can you say, ‘Show us the Father’? Do you not believe that I am in the Father and the Father is in me’: (That’s in John Chapter 14, verses 8 to 10). Earlier, John had written, about Jesus of Nazareth: ‘The Word was with God. The Word was God… and the Word became flesh and set up his dwelling among us.’ (John Chapter 1, the very start.) That’s Jesus of Nazareth, Son of Mary, Son of God, we’re talking about,- the Risen Jesus who is among us in our communities and families and hearts, with the wounds in his hands and feet and side. He is LORD! 'From his heart will flow rivers of living water' (John 7:38); detail from window in St. Clement's Redemptorist College, Limerick. 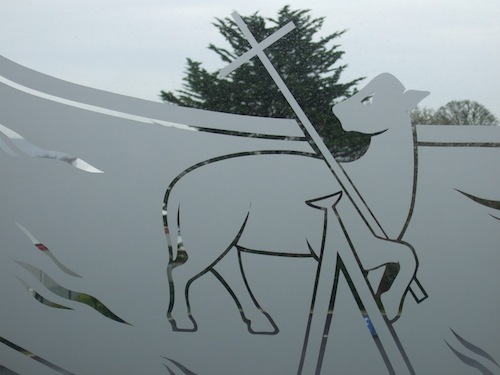 there is this phrase: ‘the Lamb…will be their shepherd and will lead them to springs of living water.’ That’s Jesus for you! 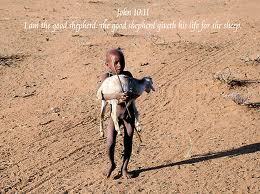 Hope you like this image of Jesus for yourself, a shepherd who will give his life for us, his ‘sheep’/people/friends. Thanks! Have a great week! Jesus is Risen! P.S. You can listen on Youtube to all of Chapter 10, in John’s Gospel, about the Shepherd. Click here. ← Third Sunday of Easter, 2013: April 14th.